On the surface, stoicism and emotion seem like contradictory terms. Yet the Stoic philosophers of ancient Greece and Rome were deeply interested in the emotions, which they understood as complex judgments about what we regard as valuable in our surroundings. Stoicism and Emotion shows that they did not simply advocate an across-the-board suppression of feeling, as stoicism implies in today’s English, but instead conducted a searching examination of these powerful psychological responses, seeking to understand what attitude toward them expresses the deepest respect for human potential. In this elegant and clearly written work, Margaret Graver gives a compelling new interpretation of the Stoic position. Drawing on a vast range of ancient sources, she argues that the chief demand of Stoic ethics is not that we should suppress or deny our feelings, but that we should perfect the rational mind at the core of every human being. Like all our judgments, the Stoics believed, our affective responses can be either true or false and right or wrong, and we must assume responsibility for them. Without glossing over the difficulties, Graver also shows how the Stoics dealt with those questions that seem to present problems for their theory: the physiological basis of affective responses, the phenomenon of being carried away by one’s emotions, the occurrence of involuntary feelings and the disordered behaviors of mental illness. Ultimately revealing the deeper motivations of Stoic philosophy, Stoicism and Emotion uncovers the sources of its broad appeal in the ancient world and illuminates its surprising relevance to our own. "A lucidly written . . . compellingly argued, and carefully researched investigation which should remain an indispensable resource for study of the Stoics on emotions for years to come. As it is pitched to readers well versed in ancient Greek literature with a fair degree of philosophical training, scholars and graduate students in Classical philosophy will benefit the most from this work. . . . A fine, soberly crafted contribution to both our understaning of the Stoics’ theory of emotion and to an appreciation of the Stoics’ subtle, insightful arguments against non-cognitivism. The patient reader’s persistence will be repaid." "In addition to a beautifully clear and uncluttered style, [the book] offers a careful and balanced account of the Stoic view of the emotions which pays all due attention to the Stoics’ accounts of psychology in general . . . education and character development, and moral responsibility. . . . A fine contribution to the increasingly plausible view that the Stoics (and Epicureans too, for that matter), in adopting a broadly intellectualist psychology, can still offer a rich and sophisticated view of human emotional life." "[A] valuable and provocative study. 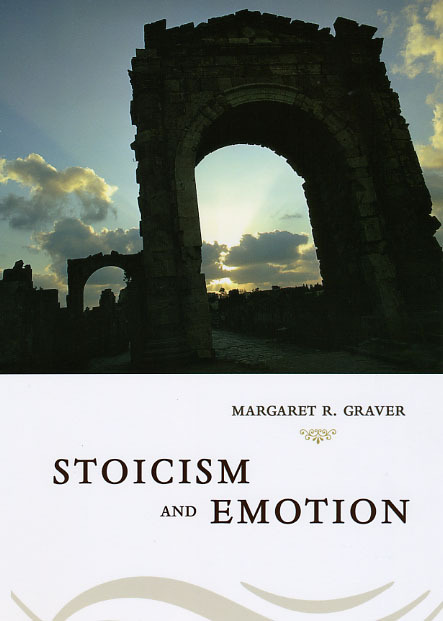 Accessible to general readers and challenging for specialists, [Graver’s] investigation of the Stoic theory of emotion succeeds in achieving her aim of sympathetically presenting the intellectual attractions of Stoic moral philosophy."